Sometimes, news stories simply distract the reader from what is really happening. The question of what exactly is or isn’t being proposed about a change to the way Labour elects its leader is one for another day. OMOV (with no greater weight for MPs than other party members) is no longer radical in the Labour Party, not least because that’s now what happens in the other two main parties. The point is that the issue has only arisen as a sweetener for the unions accepting something very unpalatable – a sweetener which Douglas Alexander and the Progress camp (for whom you can never kick the unions and the left hard enough) don’t like, want to retract and which has therefore become a stumbling block. The main story is still whether Labour will make the most radical change in the structure of the party for almost 100 years, taking a terrible risk with the party’s finances, with the express purpose of slashing union influence in the party (as if they have any). The bottom line for Ray Collins and the leadership is that the changes must bring a significant reduction in the unions’ vote at conference and, eventually, its representation and voting strength throughout the party. The “principle” of opting-in was only ever a means to that end, and one which (whatever the press statements say) they all now realise isn’t workable and can’t be delivered. 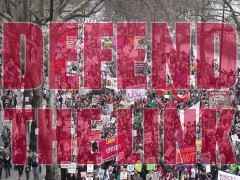 The truth is that the leadership has not had any hope of putting together a majority for what it wanted to achieve since Unite’s executive adopted the clear stance it did: insisting that collective affiliation of the trade unions should continue and that there should be no diminution of trade union voting strength or representation within Labour party structures. And it is increasingly clear that constituency parties are no enthusiasts for such radical change either. However, the trade unions, angry though they might be about the unnecessary distraction of this review, do want to reach a deal with the Leader they want to see win in 2015. And so Ray Collins has to perform a conjuring exercise. And Ray Collins is an expert with smoke and mirrors. A trade union bureaucrat his entire working life, he is an accomplished fixer. Under the cover of Refounding Labour, an exercise Ed Miliband had promised would end ‘command and control’, Ray Collins managed to introduce an entire new rule book which no-one had time to read before it was approved that extended command and control even further. How does the scheme work? You put nothing on paper until the deal is done. You don’t produce the most important detail until it’s too late to change. You have a two hour ‘debate’ mainly consisting of long platform speeches, and a single vote. You don’t publish any of the responses to the consultation. If pressed, you publish a misleading ‘summary’. And then there’s ‘divide and rule’. Collins has spent a great deal of time meeting with trade unions, one-by-one — he hasn’t spent much time drafting a report after all. When nothing is on paper, different trade unions can easily form different opinions about what is being offered. Some remain angry and are deeply pessimistic. Others are lulled into a false sense of security. As a result of which, trade unions have almost agreed to an unwritten package. Whether it is because they simply see no alternative or because they have been lulled into a false sense of security, they have almost agreed to basing their affiliations (and their votes and representation levels) on a diminishing figure. And on a ‘principle’ which you can guarantee that the wing of the party funded by Lord Sainsbury will want to return to within a very short time if union votes are not slashed fast enough. Fortunately, it seems that negotiations have broken down over the sweetener. The trade unions would be well advised to focus on the contents of the package – and not be too distracted by the wrapping. Some parts of the package will be untainted by ambiguity: elevation to the Lords for near-retirement trade union leaders. I wondering what the CLPD will do when this is all over. Will it be a case of ‘one more push for old time’s sake’? Or will they throw in the towel after lifetime of campaigning and recognise the situation for the lost cause it is? There can only be one outcome. Ed has staked his leadership on ending TU influence. He has said, time and time again, how important this is for him. If his ambition doesn’t achieve completion in March it will if he wins in 2015. Rod: I am not suggesting any kind of treachery on the part of union leaders. But I think there is a danger that they may be being misled. The promises Labour politicians (and I include Ray Collins in that category) have made to trade union leaders in recent years have been proven to be amongst the most worthless politicians make to anyone. We must learn the lessons of the past. Party members expect to see the submissions to the consultation over Collins. (they could go on membersnet)Ann Black has been to HQ and read a lot of them.I understand the majority want minimum change to the status quo.Under New Labour we had to endure phoney consultations, where the submissions went into the bin.Those members who voted for Ed to be Leader have the right to expect that he will practice what he preaches and will take the submissions fully into account. . Also,as I have said before,opt in was what the vindictive Tories brought in after the General Strike in 1927, in order to weaken our Party,weaken the TUs and weaken the organised working class.In 1946 the Labour Govt.brought back opt out.It is to be hoped that Ray and Ed will not try to reprise the dirty work of the 1927 Tories. Miliband has stated his intentions plainly. But I expect you’ll be campaigning for a Miliband victory in 2015. To me this seems pointless, you’ll be campaigning for a leader who shares none of your policy ambitions and who will use any success he achieves to pursue policies you oppose. Now that all the main parties have converged – you couldn’t put a rizla paper between the modernised Tories, One Nation Labour and the Orange Book LibDems – there is little point in voting Labour, unless you happen to think Miliband will be a prettier occupant of Number 10. But Falkirk told you everything you need to know about the ugliness of Miliband’s integrity. It’s time to remember the words of Archbishop Oscar Romero: “Conformity is the opiate of the people” and get off the slow train to disaster. Rod, why not re name the party the unite party. This is the politics of the madhouse. Instead of navel gazing we could be delivering 100,000 leaflets, making 250,000 phone calls or running 500 streetstalls for the time mebers will spend cooped up in a conference hall. While we’re otherwise engaged the SNP are out fighting for a Yes vote in the Scottish Referndum and UKIP are fomenting discontent in advance of the European elections. We should be finalising our manifesto for 2015 not wasting time and resource on an argument that members and the public don’t want. If that’s what you want then you’d best start your campaign quick. But I’m expecting Miliband to rename it the Progress Party. 1. Initiated a campaign to discredit the largest trade union in the U.K.
2. Denied a trade unionist the opportunity stand for selection as a PPC – resulting in the eventual selection of a Progress-friendly Westminster insider. 3. Contributed to the humiliation of hundreds of employees at a nearby workplace – with workers compelled to accept terms similar to those encountered in the early 19th century. For you to work for the political victory of the architects of these outcomes is suggestive of political pessimism and a deep nihilistic disaffection. Whereas my optimistic belief that there can be an alternative bears the promise and vitality of a new born lamb. Rod,the Falkirk farce has been fully analysed on Leftfutures.The working class set up the LP and support it in their millions,so we have to do something with it,it is not going to fade away.To walk away is to hand it to the Blairites and assorted neo libs. John Reid: I don’t often respond because everyone knows where you stand and life’s just too short… but you misunderstand Left Futures’s position on Progress. We don’t want to see Progress “ousted” at all. We believe in a broad church. But we do believe in reasonable regulation. Democracy and transparency are not too much to ask. Open debate and a level playing field. Radical I know after almost so many years of New Labour, but overdue. Lets support the Progressives; not the Aggressives.